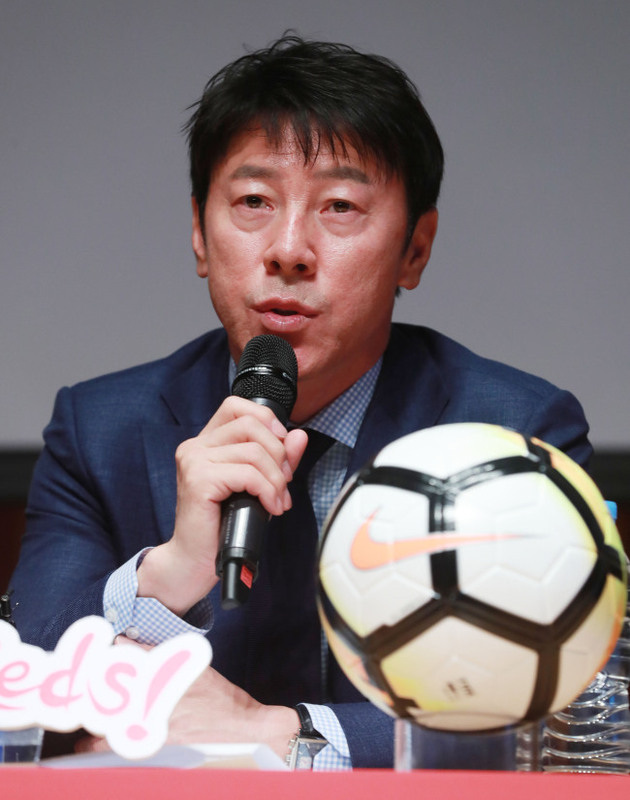 South Korea men's national football team head coach Shin Tae-yong said Monday defense is his major concern at the 2018 FIFA World Cup after his side lost key players due to injuries. Shin announced a 28-man preliminary roster for the 2018 World Cup in Russia, where South Korea will face Germany, Sweden and Mexico in Group F. The 49-year-old coach said he had to pick 12 defenders because of the injured players. According to FIFA, the deadline for the final 23-player roster is in on June 4. Shin said he will drop five players on June 3. "At this moment, forming our defense line is the most difficult part for me," Shin said at a press conference in Seoul. "There were things that I wanted to do with our defense, but I think I can't do it." Shin has lost center back Kim Min-jae, who fractured his right shin during his club action earlier this month, and left back Kim Jin-su, who injured his left knee in a friendly match against Northern Ireland in March. Both players were considered first-choice defenders for Shin. Shin said he decided to drop Kim Min-jae because he needs eight to 10 weeks for recovery. But he included Jin-su, who can currently jog on the pitch. "There is a reason why I picked so many defenders," he said. "Kim Min-jae is unavailable, and to be honest, I'm also not sure about Kim Jin-su." Kim said Jang Hyun-soo, Kim Young-gwon, Jung Seung-hyeon, Yun Yong-sun, Kwon Kyung-won and Oh Ban-suk will vie for the starting center back positions. Among them, Oh was selected for the first time under Shin's helm. "Oh would not have been on the national team if Kim wasn't injured," he said. "Oh is a tough player who is good in man-to-man defense. Since we need to beat strong opponents at the World Cup without conceding goals, I decided to pick him." Shin admitted his center back choices could be controversial considering that none of them showed promising performances with the national team. However, he said the players will prove their talents in the upcoming matches. "I know these players have to perform better than they did in the past," he said. "I hope they can silence the critics, and our coaching staff is ready to help them." As for the left back position, he picked Kim Min-woo, Hong Chul and Park Joo-ho, next to Kim Jin-su. And Shin emphasized that competition within is inevitable. For the right back position, he selected Lee Yong and Go Yo-han. "We picked these players after our coaching staff analyzed them in South Korea, China and Japan," he said. "Of course, these players will not all go to the World Cup. We will trim the squad after we play two friendly matches at home." Shin's squad is set to begin training at the National Football Center in Paju, Gyeonggi Province, next Monday to prepare for their two World Cup tuneup matches at home. South Korea will face Honduras in Daegu on May 28 and will take on Bosnia and Herzegovina in Jeonju, North Jeolla Province, on June 1. Since Shin took over the team in July 2017, South Korea have conceded 19 goals and scored 20 in 14 matches. Shin said he will try to improve their defense in upcoming weeks by strengthening defensive cohesion. Shin's team is scheduled to have two more matches in their pre-World Cup training camp in Austria. They will play against Bolivia on June 7 and challenge Senegal on June 11.